Please post your primary and secondary professions (RPs have secondary professions) to this thread. If you don't have an area of specialization, that's fine. If you know which one you want to pursue, post that too. I am a crafter/concoctor. I will be trying to get to L400 in blacksmithing and either cooking or brewing. I will either pursue The Insatiable or The Righteous quests. EDITED: I am working towards luring/brewing. 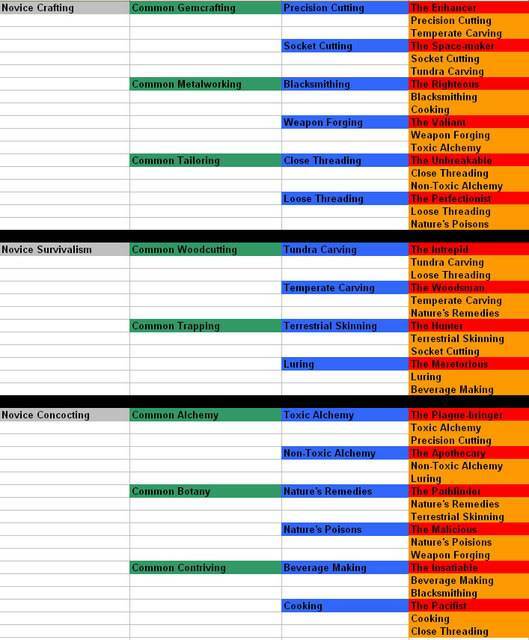 As of 5/5 Level 245 survivalism and 367 concocting. I'm a level 22 crafter. How do you pick a specialisation? [i]I haven't started any Proffessions yet do to the fact that I was wondering who was doing what and what profession that was needed the most and I'm going to training soon and didn't want to give up my house yet. I'm doing crafting and survivalism with an eye on the enhancer proficiency, but it's slow going due to lack of shrimp and time. Choose an epic to work towards and the you will know which jobs you need to advance in. I am going for the Valiant. My current levels are Metalworking 328 and Alchemy 133. Below is the rough scroll which has the professions you need to achieve the epic you want. The first Metalworking quest is as follows. Reward for silver bar quest listed above.
.: You are on your way to becoming a master metalworker! You have received 500 points. I am working towards either the Space Maker epic or the Intrepid epic. I will decide when I get there. I was considering switching to gem crafting, but since we already have that covered, I'll stay the course with my original choice.